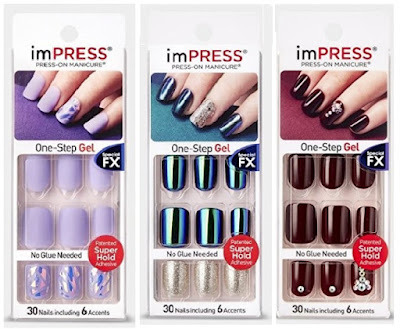 imPRESS Press-On One-Step Gel Special FX Manicure - $8.97 - with three new ready-to-wear designs: Boss Lady - lilac matte nails with shattered glass accents; Goal Digger - shiny holographic nails with silver glitter accents; and Head Honcha - deep brownish wine nails with jeweled accents - with 30 nails including 6 accent nails, prep pad, manicure stick and mini file. With a new patented superhold dual-layer adhesive - with an adhesive top layer that binds to the artificial nail for optimal adhesion to the hard surface and an adhesive bottom layer, specially formulated to be more flexible to fit your natural nail - no glue needed to apply and removal is still hassle-free! Available now at Walmart, London Drugs and Jean Coutu stores across Canada.